This month we are excited to fully embrace Spring with all kinds of gardening themed fun! My Learn + PLAY calendar sparks learning and creativity from very angle! We practice preschool/kindergarten skills such as letters, numbers, sensory play, cutting with scissors, creativity and so much more! And everyone loves the bonus activities and games in every calendar too! It’s not too late- there’s lots of April still to explore. If you’re curious what’s in the calendar keep scrolling and see why so many families are choosing to Learn + PLAY with us! Count and color is an example of an activity that adapts well for a variety of skill levels. Younger littles can count the colorful dots on the cards or simply color the sheet with the numbers and say the numbers as he/she colors. If you’re ready for more your little can play this activity like a game, turning over a card, count the dots, and color that number. Great for counting and color recognition! My littles have never met a sensory bin they didn’t like. This activity can also be adapted to practice just letters or numbers, or you can do both. Bury the letter/number circles in dry beans to create a “garden” then invite your little to dig in and find the fun! Sort and play away! Name recognition and spelling is a BIG skill for preschoolers gearing up for kindergarten! This activity is so much fun! Your little plants his/her name with bright, colorful flowers! Just add popsicle sticks! We paired this recycling activity (perfect for Earth Day celebrations) with a reading of Miss Rumphius by Barbara Cooney! It turned out to be one of my favorite art projects we’ve done all year! STEM (Science, Technology, Engineering, Math) activities in preschool are on the rise. This sink/float experiment is a perfect addition to that skill set. Just add a bowl of water and some veggies. Invite your little to make guesses (hypothesis) and experiment with the objects your family selects. Then use the images to create a report of your findings! Nurture the budding scientist in your preschooler! My littles can’t get enough of clip cards! This is a perfect independent activity for littles ready to play on their own but also a lot of fun to do together! Just add clothes pins. Don’t have a clothes pin? Do-A-Dot markers work well or stickers or any other idea that suits your family best! Fingerprints you WANT to see! 🙂 Beware your little one is going to FLIP when you tell them they’re allowed to dip their fingers in a stamp away! Practice counting creativity in this fun numeracy activity! It really wouldn’t be a garden study if we didn’t plant some seeds would it?! We started a bean seed in our homemade “Greenhouse.” This activity really took the idea of gardening to the next level for my littles. Getting to see a bean sprout and track it’s growth is so much fun! 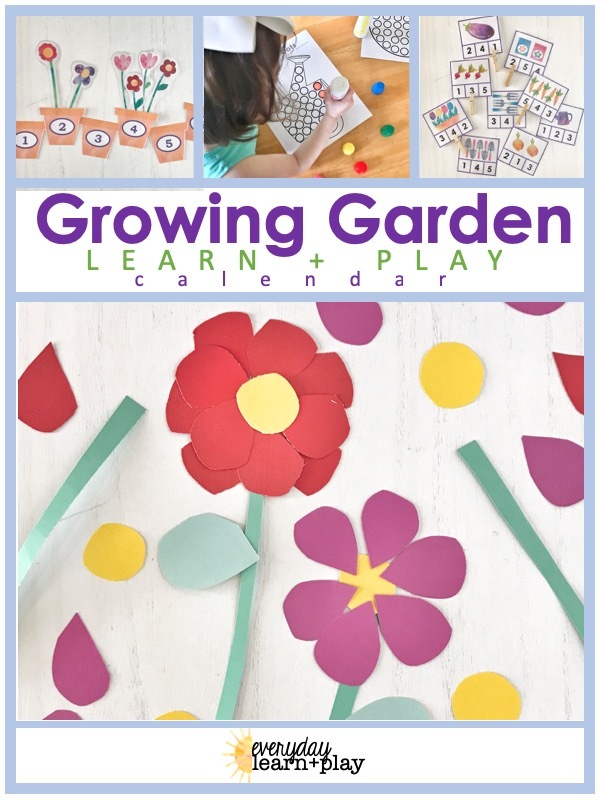 The Growing Garden Learn + PLAY calendar has 20+ activities perfectly suited for little learners. You’ll get bonus activities, pre-primer sight words, and step by step directions on how to implement the fun for your family! Ready to join us?! Find the full calendar here. Ready to join in the fun!? Find the full calendar here. Always feel free to drop a comment or send me an email if you have any questions. I’m happy to help! OR if you’ve purchased the Growing Garden Learn + PLAY calendar I’d love to hear how you are loving it! Send me a message at hello@everydaylearnandplay.com.